Cook the beans until tender in boiling salted water. Cut the bacon into dice, heat the butter in a pan and fry the bacon and onion for 3 or 4 minutes, until the onion is soft. Blend in the flour and cook for 1 minute. Drain the beans and add 8 fl oz (240 ml) of the cooking liquid to the bacon and onions. Bring to the boil, stirring, add the beans and reheat gently. Season to taste and stir in the chopped parsley. 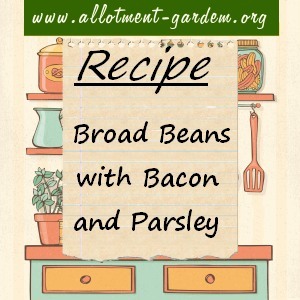 This Broad Beans with Bacon & Parsley Recipe makes 4 good helpings. A late springtime side dish that is easy to prepare and uses fresh ingredients. Considering the traditional side dish for bacon was broad beans in a white or parsley sauce, it is easy to see why this recipe works so well, using more or less the same ingredients in a different manner. If you have a glut of broad beans, don’t forget that they freeze well.